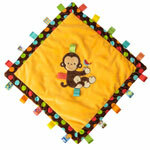 Dazzle dots monkey character blanket measures 13.5" x 13.5". It is made with ultra-soft microfiber fabric and features embroidered detailing. 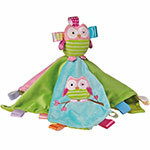 Each Taggie isadorned with patented looped ribbon tags that babies love to explore and rub. Provides tactile and visual stimulation for your baby. Mary Meyer products are all made to strict quality standards to meet or exceed US toy safety requirements. 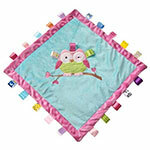 The blanket features a cheerful embroidered face, polka dots and patented Taggies pull tags. The dazzle dots monkey soft toy is sure to become an immediate favorite with your baby. With truly innovative attributes and small beginnings, Taggies has revolutionized and redefined how little ones feel secure and engaged in play. Originating with a mother's observation that her baby was more interested in the satin tags on toys than the object itself, today Taggies offers a broad array of simple but fun products designed to enhance a child's growth and sense of security. At the core of our brand are the unique, interactive, and patented looped tags to touch and explore. The snuggly soft fabrics, colors, and textures of Taggies help nurture a child and provide simple opportunities for fine motor skill development and sensory stimulation. Recommended for ages 0 months and up. Rated a top toy for 1 year olds.